It is 3 am and, if I am to believe my cellphone, it is also -9°C in Puno, Peru. Even if there was heating in the place where I am staying (and there is none) I would probably still be cold. But my excitement compensates the weather as I am heading once again to Radio Onda Azul (ROA) for its “Quechua Rimayninchik” weekday program. Andean music, plenty of jokes, calls from communities far away, but also reflections on the state of indigenous peoples nowadays: all of these and more come together from 3 to 5 am. Chaska and Norma, two women in their early 30s, are in charge of facilitating these exchanges and making sure that the conversation keeps flowing. Kay podcastpi, huk tayta paypa ususin ima runasimimanta rimashanku. Paykuna Perumanta kanku, ichaqa ña wakin watakunaña New Yorkpi tishanku. Tayta runasimita rimayta atin, ichaqa paypa ususin mana atinchu. Paykuna imaraykumanta rimashanku. En este podcast, un padre y su hija hablan sobre su uso del idioma quechua. Son del Perú, pero ya desde hace unos años viven en Nueva York. El padre puede hablar en quechua, pero su hija no, y conversan sobre esta realidad que viven a diario. In this podcast, a father and his daughter speak about Quechua language use in their family. They are from Peru, but have lived in New York for many years. The father can speak in Quechua, but the daughter cannot; together they reflect on this reality. Join us Tuesday, October 18 to witness the wonderful peruvian scissors dancers performance at the KJCC Auditorium! Originating in the southern region of Peru (Ayacucho) during the Andean resistance period (in the middle of the 16th century), ancient Scissors Dancers were prohibited for being considered rebels, heretics and possessed by demons. However, they fought – through dance – against the Spanish rule and Catholic mission process that promoted the extirpation of Andean gods and deities. Even so, they have survived up to present day. The performance will feature two dancers competing while accompanied by two musicians playing an Andean violin and harp. CLACS Quechua professor Odi Gonzales and current Quechua students will share remarks during the event as well. The Scissors Dancers are Peruvian citizens who live in New York and Connecticut. Dancer Steve Cota Quispe, who hails from from Ayacucho, is the coordinator. Here’s a sneak peek of what we’ll bear witness to next week. Be sure to join us Tuesday, October 18 at 7:00 p.m. Thanks to everyone who joined us last Friday for our event ‘A New-New Left in Latin America? : The Challenge of Progressive Politics in the Midst of a Conservative Turn.’ More than two hundred students, professors, activists, local media, Peruvian journalists and community members joined us at KJCC Auditorium to hear former Peruvian Presidential candidate Verónika Mendoza speak about the rise of a ‘New-New left’ in the region. CLACS Assistant Director Omar Dauhajre presented the event and panelists. Speakers included essayist and poet Mariela Dreyfus who highlighted the feminist activism in Peru and Jose Luis Rénique, historian and principal professor at Lehman College, who discussed democracy, education, and the promise of the left. Panelist Paula Garcia shifted the conversation to the challenges of the Frente Amplio as an organization. 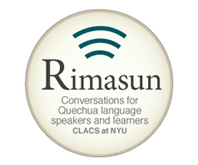 You can watch a video of the event on the CLACS NYU Youtube page, included below! Thanks again for joining us, please be sure to learn more about our events on our webpage here. The Center for Latin American and Caribbean Studies (CLACS) at NYU would like to welcome back our students and faculty and wishes all our followers a happy Fall! We kicked off the semester by enthusiastically welcoming our newest MA students at orientation. We are excited to have such a dynamic group begin a new academic year. 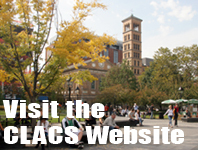 Stay tuned for CLACS events this fall by joining the CLACS email list, liking CLACS at NYU on Facebook, and following us on Twitter at @clacs_nyu! I am used to being asked what anthropology is and what, as an anthropologist, do I “actually” do. I usually have a different set of answers depending on my interlocutors. But something that I always have to deal with is the “classical” definition of anthropology, the one that implies studying “a traditional way of life”. Although that definition can be a good starting point for a conversation, I try to bring it to and interest in social changes as soon as I can. If not, how to explain that analyzing the ways in which radio affects – or comes from – everyday life is also anthropology? When studying media as social and cultural repertories, anthropologists have a lot of competition in the field. I am constantly mistaken for a journalist working on a piece, which changes the interactions with my interlocutors. What has this interest on radio to do with my search for Aymara and Quechua identity definitions and its connections with the international indigenous movement? In Puno the answer is: a lot. Radio has been present in Altiplano’s peasants’ life for a long time. In part due to the low electrification of the region, radio has been – and in some districts of Puno still is – the most popular communication device. The first radio to begin operations in Puno was Onda Azul, back in the 1950s. This is not only the first radio, it is also a very special one. It comes from an early initiative of Puno’s Catholic Church and answers to the developmental model of educación popular. In a time when Puno had one of the highest levels of illiteracy, Onda Azul worked hand in hand with the Peruvian government to develop a program of escuelas radiofónicas. Radios were given in different communities in the Aymara and Quechua sectors of Puno and every day the people would come together to listen to classes and solve exercises with the help of a facilitator. At the end of the school year, the Ministry of Education would organize exams for the people involved in the radio classes, and hand out official diplomas to the ones who passed everything.